First up, the paper from University of Iowa researchers who were shocked when mice bred to overgroom, a version of obsessive-compulsive disorder, were crossed with mice bred to become obese. In the obese mice, researchers knocked out a gene coding for MC4R, a protein that affects feeding behavior. In the overgrooming mice, the researchers knocked out a gene coding for SAPAP3, which governs neuron reactions to sensory input, causing the mice to obsessively clean themselves to the point of causing lesions. Cross those two mice, and voila, you get ones that are pretty much ordinary, the U of I researchers found. The U of I release is here, but frankly, it’s pretty confusing. Prominent blogger Scicurious, at the Scientopia Neurotic Physiology blog, has a better explanation, although it’s still a bit technical. The illustrations pulled from the paper help make it clear, however. Next, the folks at the Ames Laboratory, a U.S. Department of Energy facility at Iowa State University, are messing around again with quasicrystals, the discovery that earned Daniel Schechtman (an ISU- and Ames Lab-affiliated chemist) a Nobel Prize. The latest work combines experimentation with computational science, a realm that lets chemists simulate what atoms will do so they can focus their lab work on the combinations likely to produce the properties they seek. The new quasicrystals are “the only known magnetic rare earth icosahedral binary quasicrystals,” the Ames Lab release says. The research is published in Nature Materials. 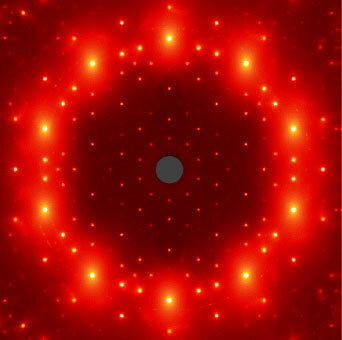 The lab, capitalizing on its strength in materials, has investigated these strange quasicrystals, which have an ordered, but non-repeating (non-periodic) structure. Their latest work focuses on how quasicrystals’ structure affects their magnetic properties. Now, the pigeons: U of I researchers got some attention late last month for using touchscreens to test their (the birds’, not the researchers’) intelligence and ability to learn. The pigeons worked with an animated version of the string test, a common measure of intelligence that involves figuring out how to reel in a treat by pulling on the correct string. In this case the pigeons went high-tech, pecking on touchscreen buttons to pull virtual strings attached to mere images of the treats. The pigeons, no birdbrains, figured it out, even when the “strings” were crossed. The video is posted above, but you can find more here. The U of I release lays out the research pretty well, but for more insight, go to Ars Technica. Be sure to check the comments, which include a link to another video, from the 1940s or ‘50s, of pigeons in training to do missile guidance. (Yeah, missile guidance.) Their behavior is remarkably similar in the modern and Cold War-era tests. Of course, pigeon intelligence comes as no shock to my wife. They seem to have an unerring knack for finding her car.